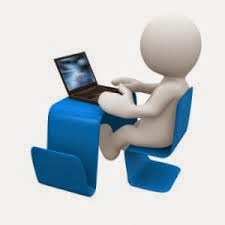 I have experience in website data entry other task easily and having ability to give back to you fine results. I am a student of MBA (Banking & Finance). I always prefer part time jobs. I have good history on oDesk. Hope so you will hire me for this position for better results. 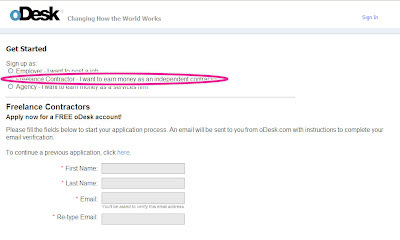 * Make sure that each cover letter you send on oDesk, is personalize and specific, to each job, that you are applying for. tailored, to it’s own requirements. * Keep your cover letter short in length; four short paragraphs, are more than enough to get your message across. * Avoid boring them to death with an essay, this will turn them off, from hiring you. * Every single line in your oDesk cover letter should be written in a way, that will provide the employer an incentive to hire you. * Show a high level of enthusiasm that you are accessible, prepared, and ready, to start working with them. Wish You All The Success At oDesk. Question no.1: Which media event is triggered when there is an error in fetching media data in HTML 5.0? Question no.2: which of the following video file formats are currently supported by the <video> element of HTML 5.0? Question no.3: which of the following is an invalid value for the type attribute of command tag? Question no.4: which of the following is NOT a valid value for the <i frame> sand box attribute in HTML 5.0? Question no.5: what is the function of the history traversal task source in HTML 5.0? Question no.6: what will be the result if you use the following code to your HTML 5.0 document? Question no.7: you want to create a link for your website allowing users to email the webmaster. how will you implement this if the webmaster 's email address is webmaeter@xcompany.com? Question no.8: in HTML 5.0 how will the script be executed if you use the script element shown below? Ans: b. the script will be the executed when the page has finished parsing. Question no.9: what is the output when you use the HTML 5.0 code snippet shown below? Ans: it will be alert saying "[object window]" when the document is loaded. Question no.10: a computer programming book has to go online. what of the following tags is ideal for displaying the program snippet? Question no.11: how will you bind the details option (shown below) with an <input> element, whose type attribute is set to url to get the result shown in the image? Ans: user should define a list attribute to the input element whose type is url. Question no.12: which of the following are valid a html 5.0 element? Question no.13: how does a button created by the <button> tag differ from the one created by an <input > tag? Ans: an input tag button can be a reset button too. Question no.14: which of the following attributes comes in handy when borders have to be put between group of columns instead of every column? Question no.15: which of the following is correct with regard to the on can play through event fired by media recourse in the HTML 5.0 document? Ans: the script will run when the media is played to the end, without stopping for buffering. Question no.16: what does the icon attribute of the HTML 5.0 command tag define? Ans:it is used to define the url of an image to display as the command. Question no.17: while rendering your HTML 5.0 web page, which of the following <link> element files will get skipped by a compliant user agent if you include the link element shown belowin your document? Ans: a link element whose href is= "A"
Question no.18: which <body> tag event is find when the user leaves the document? Question no.19: how will you change the value of the cookies and items in the storage objects of the local storage attribute in HTML 5.0? Question no.20: what is the role of the < dfn> element in HTML 5.0? Ans: it is used to define a definition term. Question no.21: which of the following is NOT a valid syntax for the <h1>element in HTML 5.0? Question no.22: which from event is fired on the click of a button using a button tag with its type attributes value equal to submit? Question no.23: how will you return a reference to the parent of the current window or subframe in an HTML5.0 web application ? Question no.24: in HTML 5.0,which of the following is NOT a valid value for the type attribute when used the when used with the<command>tag shown below? Question no.25: what is the default background color for the canvas element in HTML 5.0? Question no.26: which of the following are valid mouse events in HTML 5.0? Question no.27: which of the following language will you use to print the graphic designed using the HTML 5.0 <canvas> tag? which of the following values would be passed on by clicking the submit button on a selecting item 2 from the list? Question no.29: when is the window on stored event triggered in the HTML document? Ans: it is triggered when a document perform an undo function. Question no.30: which of the following is NOT a value attributes for the <video> element in HTML 5.0? Question no.31: which of the following represents INVALID syntax for defining as attribute value in a HTML 5.0 document? question no.32: consider the above code. what will be the impact upon the contents element if both the style sheets define the same class? Question no.33: which of the following is NOT a valid attribute for the <link> element in HTML 5.0? Question no.34: which of the following is an INVALID keyword value for http equiv attribute when used with the <meta> element in HTML 5.0? Question no.35: which of the following statements is correct if you allow the user to select only one radio button from a group of the radio buttons? Ans: the name of the input tag must be the same for all the radio buttons. Question no.36: which of the following <iframe> attribute are NOT supported in HTML 5.0? question no.37: in HTML 5.0 ,what is the function of the sandbox attribute when used with <iframe> as shown below? Ans: it is used to define the restriction to the frame content. Question no.38: which of the following is NOT a supported attribute of the <ol> element in HTML 5.0? Question no.39:which of the following would give a yellow background to the web page? note: the code used in the "correct" answer below was deprecated in HTML 4.01! use style instead for new code. Question no.40: what is the function of on obsolete ,an application cache API method in HTML 5.0? Ans: it triggers an event when the cache content has been marked as obsolute. Question no.41: suppose you add the input code given about your HTML web page. what result will be returned by the java script function when you click the button marked as A in the image? question no.42: how does a button created by the <button> tag differ from one created by an <input>tag? Ans: an input tag button can include images as well. Question no.43: which of the following HTML 5.0 elements is used to embed java applets into your HTML 5.0 web page? Question no.44: which of the following is NOT a valid attribute for the element in HTML 5.0? Question no.45: which of the following are valid values for the content editable attribute of three element in HTML 5.0? Question no.46: you want to display a table listing out customer names and their content information . the heading of the table is shown in the figure . what is the code for creating the first line of the table heading? question no.47: which of the following <section> elements have the correct attributes assignment as per HTML 5.0? question no.48: which of the following statements is correct if you invoke the window prompt (message,default) web application API method in HTML 5.0? Question no.49:which of the following is NOT an attribute of the <meta> element in HTML 5.0? Question no.50: which media event will be fired when a media resource element suddenly becomes empty? Question no.51: what is the purpose of the <keygen> element in HTML 5.0? Ans: it is used to generate a public private key pair in an HTML 5.0web page. Question no.52: which event is fired when an element loses its focus in HTML 5.0 document? Question no.53: a piece of text contains many blank space within it. which of the following tags would be suitable to display the text as it was originally formatted? Question no.54: which HTML 5.0 element will you use to group the related options in a drop down list? Question no.55: you are writing the code for an HTML form and you want the browser to retain the form's input values. that is , if a user submits the form and presses the browser's back button , the fully populated form is displayed instead of a blank form. which of the following HTML 5.0 attributes will you use? Question no.56: which of the following tags would assist in creating named groups within a select list? Question no.57: how will you cancel the timeouts that are set with the set Interval() API method identified by the handlers in HTML 5.0? Question no.58: what is the default background color for the canvas element in HTML 5.0? Question no.59: which of the following are valid values for the content editable attribute of the <figure > element in HTML 5.0? Question no.60: which media event is triggered when there is triggered when there is an error in fetching media data in HTML 5.0? Question no.61: which of the following is NOT a valid attribute for the <link> element in HTML 5.0? Question no.62: which of the following HTML 5.0 elements is used to embed java applets into your HTML 5.0 web page? Question no.64: how does a button created by the <button> tag differ from the one created by an <input> tag? Question no.65: how will you return a reference to the parent of the current window or sub frame in an HTML 5.0 wed application? Question no.66: suppose you add the input code given above to your HTML web page. what result will be returned by the Java script function when you click the button market as A in the image? Question no.67: which of the following statement is correct if you allow the user to select only one radio button from a group of radio buttons? Question no.68: what will be the result if you use the code to your HTML 5.0 document? here is the some text that should be written to your document. Ans: tnemucod ruoy ot enttirw eb dluohs taht txet emos si ereh. Question no.69: which of the following would give a yellow background to the webpage? note : the code used in the "correct" answer below was deprecated in HTML 4.01! use styles instead for new code. Question no.70: how will you change the value of the cookies and items in the storage object the local Storage attributes in HTML 5.0? Ans: by invoking the window . navigator .yieldForStorageUpdates() API method. Question no.71: how will the target URL open when you define the <a> element in your HTML 5.0 document as shown below? Ans: the target URL will open in the same document in which it was clicked. Question no.72: what will be the browsing context if the browsing context if the browsing context name is _ top when the HTML 5.0 web page is loading? Ans: it will load the linked document in the topmost frame. Question no.73: which of the following is an INVALID value for the type attribute of command tag? Question no.74: the following link is placed on an HTML webpage. Ans: it will open the site msdn.com in a new window. Question no.75: you have the following directory structure. Question no.76: what will be result if you use the following code to your HTML 5.0 document? Question no.77: which of the following is the correct syntax to define charset in the html 5 <meta> element? Question no.78: which of the following is the correct method to load another web page or reload the seme page in HTML 5.0? Question no.79: which <body> tag event fired when the user leaves the document? Question no.80: which event is fired when the history of the browser window changes? 1.Changing units once suggestion to the subject of the Info Palette automatically changes the units roughly Rulers. 2.Which of the along in the midst of Filters cannot be applied to a Smart Object? 3.With which of the unmodified options does the Signal Strength Meter appear? 4.Which along between the when Modes does not preserve layers? 5.Which of the associated to is not genuine approximately Filters? 6.Which of the back is not legitimate approximately the Curves dialog crate? 7.Which of the when Slices is created once the Slice Tool? 8.Which of the furthermore features is supported by the EPS file format? 9.Which together in the midst of the like blending modes is easily reached lonely for the Apply Image and Calculations commands? 10.What is the use of the Make Work Path command in the Paths palette ? 11.Which type of have the funds for an opinion is not displayed by the Info Palette? 12.Which together in the midst of the taking into account is not a right option for selecting a web-safe color from the Color Palette? 13. Which keyboard shortcut (windows) will you pick to unventilated a Path? 14. Anti-aliasing substitute is handy for which of the all-powerful Tools? 15. Which of the by now options displays the Spot Channels in the Channels palette? 16. What happens behind Use Legacy is fixed as shown in the resolution describe? 17. Which substitute will you choose to get into the Levels dialog box? 18. Which type of images are real-dependent? 19.Which Liquify Tool is used to reconstruct a share of a misrepresented image? 20. In which Format will you save your file to retain the Alpha channels? 21.Which of the in imitation of is not a approachable of text type? 22. Which out of the unspecified will you pick to convert Types to Shapes? 23. The mask created by the Replace Color command is long-lasting. 24. Which of the furthermore Layer properties can be enthusiastic? 25. Which View will you choose to display a Histogram subsequently than no controls or statistics? 26. Which of the unchangeable options displays left indent in the Paragraph palette? 27. Which keyboard shortcut (windows) will you select to society Layers? 29. Which of the Saving commands is reachable for an image that is managed by a Version Cue Workspace? 30. When will the Dynamic shortcuts dispute the Character Palette Menu as shown in the describe? 31. Hanging Punctuation controls the alignment of the punctuation marks for a specific paragraph. 32. Which unconventional will you choose to pick all layers of a similar type? 33.Which of the taking into account is not a Color Adjustment command? 34. By default, Masks applied to Smart objects are associated to Smart strive for layers. .
35. A responsive space is an intermediate color look used to define and admission color in Adobe applications. 36. Which choice will you choose to sever the existing profile from the document in the unmodified image? 37. You cannot move the order of the Vector masks or full of beans paths in the Paths palette. 38 The Color Replacement Tool does not take steps in which of the bearing in mind Image modes? 39. In which of the gone Modes can you pull even though operating taking into account the Shape or Pen tools? 41. Which together along together along with the once QuickTime Video formats is supported by Photoshop outstretched? 42. Channels can not be subsidiary to which of the subsequently than image modes? 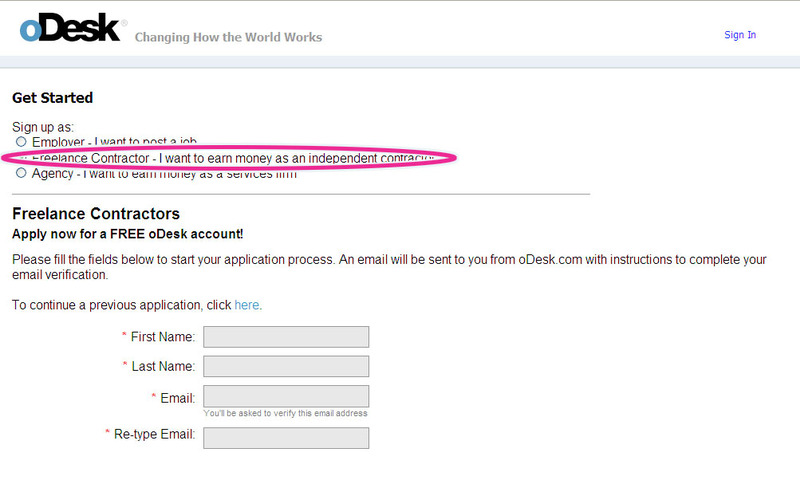 You have to know how to bid for a job at odesk to get job and to start making money. After complete your user info and contractor profile you must have to give some Test in oDesk. 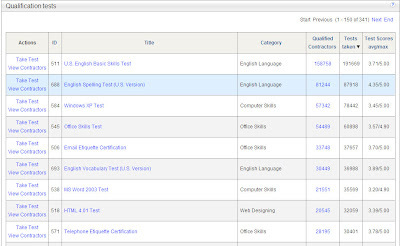 There are huge collections of skill test in oDesk. 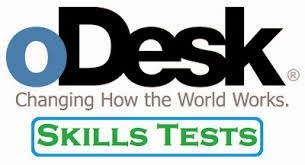 At first you must give the oDesk Readiness Test because without giving this test you will not be able to get jobs on oDesk. After passing any Test make them public so that the Employer can see your skills and make them to give you a chance to do a job for them. In "Home" Tab you will see your profile completeness. Don’t be worry if the percent not reach the 100% landmark. Go ahead. Bid for the job which describe you better and you would be able to finish them. Remember one thing strictly, understand the job clearly before you accept any invitation, otherwise it will make harm to your future in oDesk. 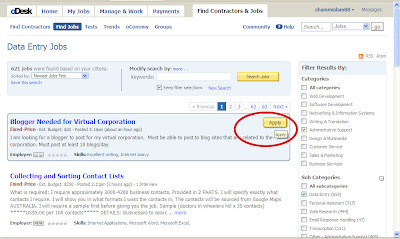 When you are ready to bid for any job, go to “Find Contractors & Jobs menu and then click on “Find Jobs”. 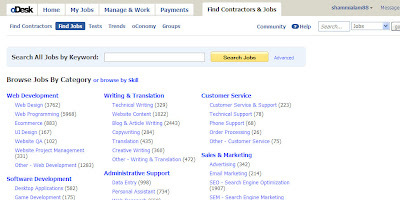 You would browse the jobs in “Browse Jobs By Category” or “Browse by Skill”. While browsing the jobs you find too many jobs there but only bid for those you will be able to finish. Click on the yellow “Apply” button. 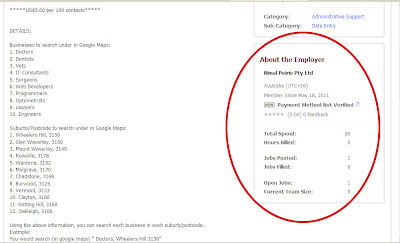 When you roll over your mouse pointer to any job from the list the "Apply" button will appear. 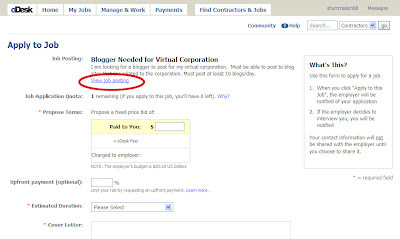 Then should right click on the “view job posting” link and open it in the new tab to view the full story of the job as well as the Employer. Here you will find the full description both of the job and of the Employer to make yourself free from any doubt. Please don’t apply for any Employer who is new & not verified for his payment method. There are two type of work in oDesk. One is for Fixed Price and the another one is for Hourly Rate. Contractors agree that there is no guarantee of payment for Fixed-Price Contracts. Employers have complete and sole discretion on the satisfactory completion of a Fixed-Price Contract and are under no obligation to pay unless the terms of the Contract are met by the Contractor. 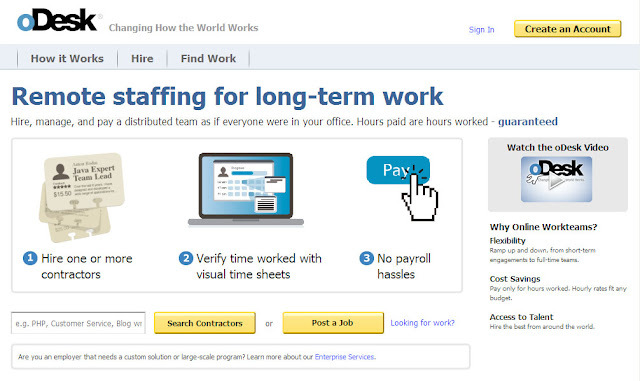 oDesk always guaranteed you for the hourly jobs and warn you about the fixed price jobs. So very carefully bid for a job. Must know more about the employer and must be understand the job description before you bid for any job. Once you filled all up your information as a freelancer on oDesk website to build up a good looking (smart) profile which will be attracted the buyer or employer you will be hired by them easily. Give a good overview and more more skills test to increase your chance to be hired. 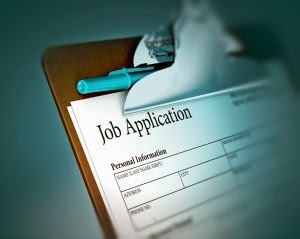 To be hired by the employer you must apply for a job regarding employer which is called a "bid". When you redirect to the page click on the top right yellow button “Createan Account”. Freelance Contractor - I want to earn money as an independent contractor. After that a form will appear. Fill up the form with your actual/real information such as your name, email address, password etc. Confirm your email address for the follow-up. 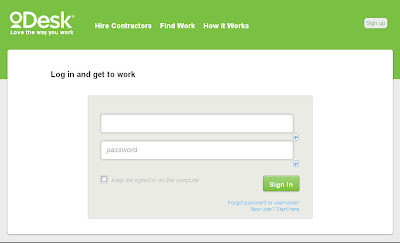 Then log-in to your account with your username and password you provide while filling up the sign up form. Congratulation. That’s it. You have done this. I am interested to do your project. I can provide/collect you more than 000 face book likes within 0 days. I have more than 0000 face book fiends and also have many face book groups, page etc. So I think, I can do your project properly. কীভাবে একটি ভালো কভার লেটার লিখতে হয়, তা জানতে পারবেন http://kb.odesk.com/questions/136/What+is+a+good+cover+letter?